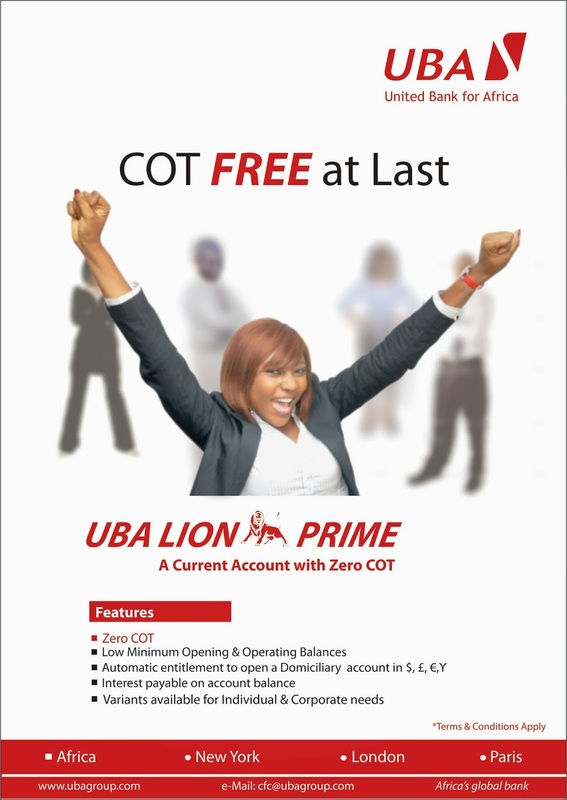 Are you a bank customer tired of paying COT on your current account?, then a UBA Lion Prime account is just your ideal solution. By opening a Lion Prime Current Account with UBA, customers will not only enjoy COT free transactions but also receive interest on their account balance. UBA has introduced the account in response to requests by customers for an account that enables them to carry out high volume transactions without incurring charges. The account is perfect for small business owners, self employed professional and business executives, entrepreneurs, non-governmental organisations (NGOs), religious organisations, schools, as well as societies and associations. The Lion Prime Account comes in variants which have been specifically structured to meet the needs of different members of the society in such a way that it matches their expectations. Ms. Olumide Osunyomi, Head of UBA’s Retail Products unit says that “the Lion Prime Account double benefit system is its significant advantage, in that you earn interest on your current account balance while enjoying COT free transactions”. She explained that the account is ideally designed for the cost sensitive business or individual especially, “Schools, NGOs, Religious Organisations, Societies and Associations will find the Lion Prime Current Account particularly attractive and well suited to meet their needs due to the nature of their operations” which essentially involves collections and payments. “The account is also suitable for small businesses, self employed individuals, sole proprietors, small partnerships”, she said. Customers who operate the Lion Prime current account will also have access to the array of e-banking products available to all UBA account holders. Account holders will have to access to the bank’s online banking platform, U-Direct which will enable them carry out a large proportion of their banking transactions online without physically visiting any branch of UBA. UBA had earlier re-launched a hybrid savings account called U-Gold. The U-Gold savings account allows customers to issue cheques for third party withdrawals just like they would be able to do with a current account. U-Gold is reserved for customers that want to have a low cost savings account but desire the convenience offered by a current account. Though U-Gold is a saving account, account holders can still issue cheques to other people to withdraw money directly from their accounts. Cheques on the U-Gold account are however not eligible for clearing purposes as they must be cashed in person by the bearer. U-Gold makes it easier for the account holder to carry out banking transactions without having to visit the bank always. A U-Gold savings account can be opened with a minimum of N5, 000.00 only, giving account holders access to UBA’s range of cost saving e-banking products and services like internet banking, a personalized debit card among others. United Bank for Africa (UBA) is a pan-African bank with operations in 19 African countries including Nigeria, as well as offices in New York, London and Paris providing broad-based banking services to over seven (7) million customers. The Group offers a bouquet of banking services and products designed to meet the specific banking needs of its diverse multi-cultural and multi-lingual customer base in three uniquely different continents.